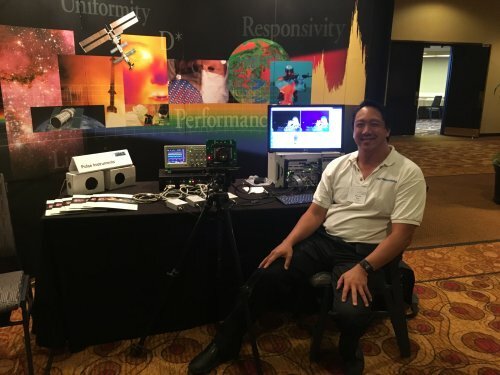 Pulse Instruments is a world leader in flexible test electronics for FPAs, ROICs, CCDs, and visible CMOS imagers. PI systems combine the convenience of "push button" radiometric testing with the flexibility to define any test for nearly any FPA or ROIC on the market, while providing the low-noise performance that's been our hallmark since 1974. Shown here, at the II-VI Materials Workshop, is a small, transportable system running an uncooled microbolometer FPA, with fully corrected, real-time imaging on the monitor. Systems can be programmed to run cooled or uncooled detectors in MCT, InSb, InGaAs, QWIP, T2SL, PbSe, VOx, aSi, or materials yet to be engineered. Our software supports integration with blackbody and visible sources from SBIR, CI Systems, EOI, and Inframet for fully automated radiometric characterization and production test. Come see why our systems are used by nearly every major FPA manufacturer and test lab on the planet.